Put down 8 sticky pistons, four on each side, facing inward. There should be four empty spaces between them. Now add four more pistons, two on each side, facing whichever way you want the entrance to be. Half of your pistons need butts. Give them butts. Add two blocks to each side, with the bottom block toward the front and the top block toward the back. Step 4 The Roof Is On Fire! Okay, the roof isn't on fire, but the roof is on. Cover your pistons, and make a roof across the top of your passage. Time to add some repeaters. Add one on each side, facing toward the back of your door. Then add four to the roof, leaving a 2-by-2 space in the middle. These repeaters should be facing away from the middle, and the two in the back should be set on the last delay setting. The two in the front should have no extra delay. Step 6 Wire It Up! You're almost done! I bet you can nearly taste that sweet, sweet piston action. Wire that bad boy up! You're essentially just putting redstone on every square that you can see from above, which should be 12 squares of redstone altogether. Step 7 Add your switch and you're done! Your switch needs to attach to the four-block redstone square in the middle of the roof of your design. BAM, done! Now you can just insert this mechanism into any pre-existing wall (or build one around it) and you're good to go! In case you have trouble making your door flush with the surrounding wall, here's what you do. Turn the door on, so that your pistons are all fully extended. Cover it up with whatever you want it to be covered by (any other block type will work). This is what it should look like when you're done. Just a flat, featureless wall... Until you pull the switch! Then POW! Door out of nowhere! This is a really great design, pioneered by our very own member nicholas1413 (aka SilentCircuitry on YouTube, check out his channel!). 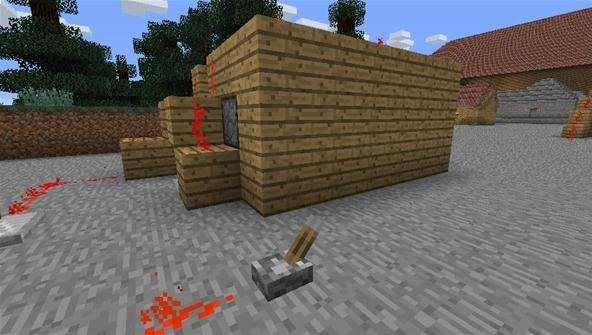 It's great because none of the redstone will show if you don't want it to, and you can incorporate this mechanism into any wall where you have three spaces on each side, and two spaces above. Oh, smart design. The bottom middle pistons have to get powered through other pistons... Very clever. Well, great tutorial! This is indeed the easiest design to hide that I have seen. The only problems I see is that there is a little piston lag between the upper and lower middle pistons, and his you have to power it. 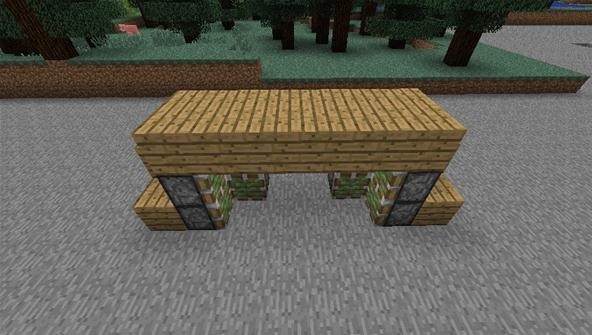 You see, because you have to power it from othe upper middle, you have to run the redstone line behind it else it interfere with the other pistons or unsmooth the nice wall. 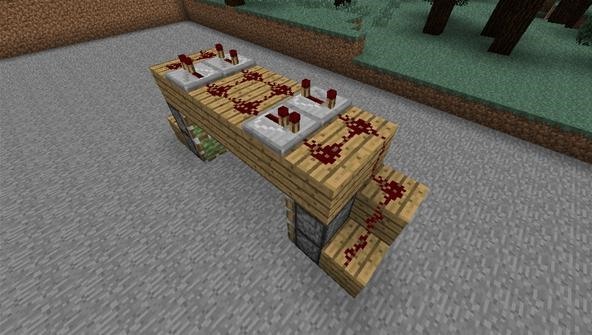 If someone found out a good way to efficiently run the redstone from the top, this would be much more effective at being hidden. Besides that, this is great! 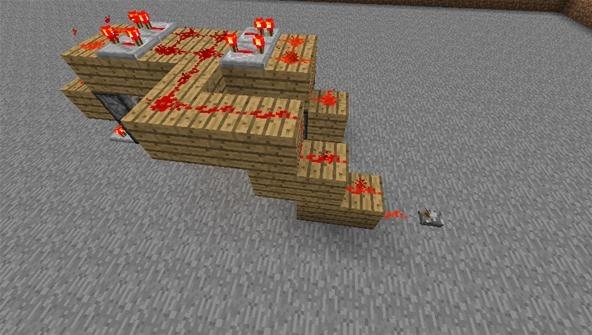 It's true, but technically if you couldn't spare that extra row necessary to separate the redstone going to the switch, you could always raise it up so that it wouldn't interfere with the other redstone wire. That way there would only be three rows of redstone rather than four. Really, this is by far the best way I've seen to do it, and I fully plan to incorporate this style into my work from now on. Much thanks to nicholas1413 for the design! I agree, thus really is a great design... Just it doesn't make sense. I was testing it out and apparently redstone works in more ways than I thought. Of course the side pistons and top middle ones are obvious and similar to what my ideas would use, but the bottom two seem to be some sort of glitch. The two diagonal blocks power the four pistons, but the repeater is what is necessary for the middle to push out. Funnily, it appears as though when you have activated pistons or powered wire above, lower pistons react to block changes. I placed all of the pistons the same way as normal and had a layer of blocks over them all. 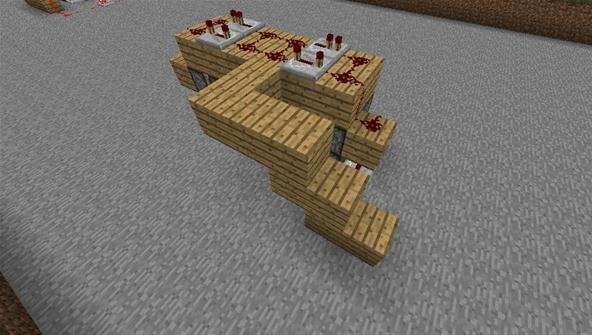 Then I placed a few repeaters pointing away from the middle four redstone (similar to the picture, where one set allows all of the pistons to open closing the door and the back set hold a delay on the middle pistons to open it). When the top was powered, only the obvious pistons would extend (the ones expected to be affected by redstone. BUT, when I placed. 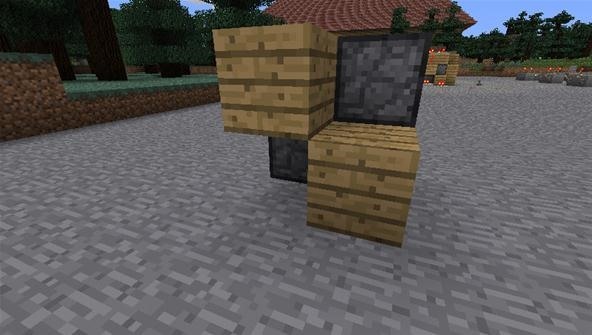 middle four redstone (similar to the picture, where one set allows all of the pistons to open closing the door and the back set hold a delay on the middle pistons to open it). When the top was powered, only the obvious pistons would extend (the ones expected to be affected by redstone. BUT, when I placed any blocks on the ground next the the bottom four side pistons (two on each side), the whole bottom row would activate concealing the passageway. There was no redstone touching any of the bottom pistons and the middle ones activated also. What I am trying to say probably sounds really confusing, but my point is that the redstone is acting funky. I need to investigate and see why this happens. If it turns out that the pistons actually do sense block changes... We could have a lot of creativity to be expected. Well, I did it. 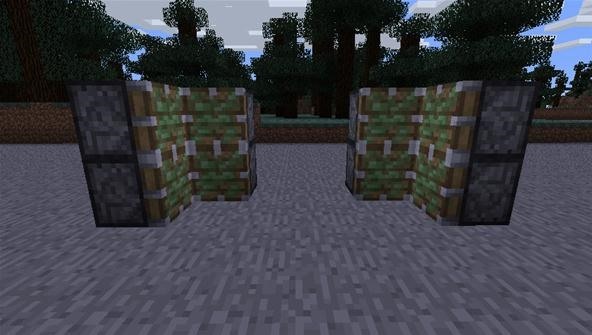 I've invented what I hope to be one of the most compact block change detectors in minecraft history. Not only does it do the job, but it will be easier to incorporate into builds. 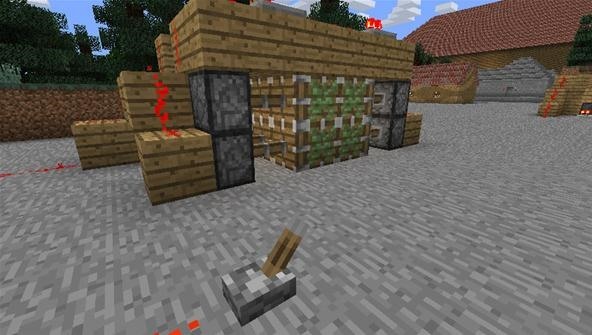 There is no redstone under it so it will be easier to keep above ground to make a more easily concealed redstone contraption. Also, there is no water involved like other designs, eliminating the risk of wiping out your creation! 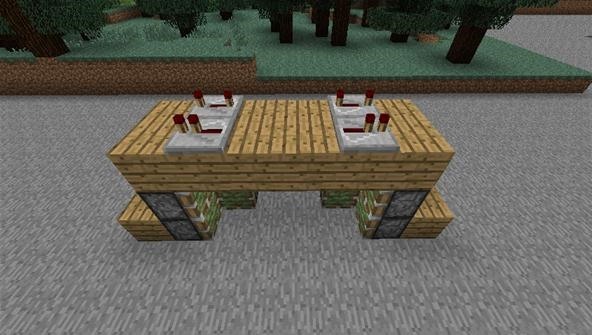 If people can learn to use this, it could be the next improvement to modern redstone technology (like the redstone refrigerator, but to redstone experts who know how to use logic gates). Awesome! Make a tutorial on how to do it, and share it with us! It's a little difficult to explain and doesn't really make sense, but I'll try =D . I would have today when I figured it out, but I was busy - I had a sport practice for three hours after I got home from school and homework :( . 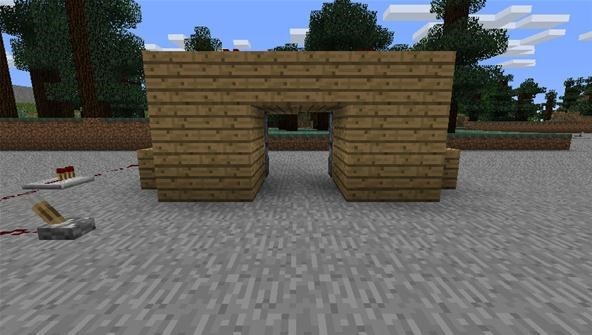 Hey there is a easier way to do a secret door all you need to do is make a 1 door frame then put signs on the inside in the middle one on each side then, you will have to put a painting that is 2x2 that covers the doorway you then will be able to go through the painting. Cons: Mine Through If you get spotted they will be able to get in. 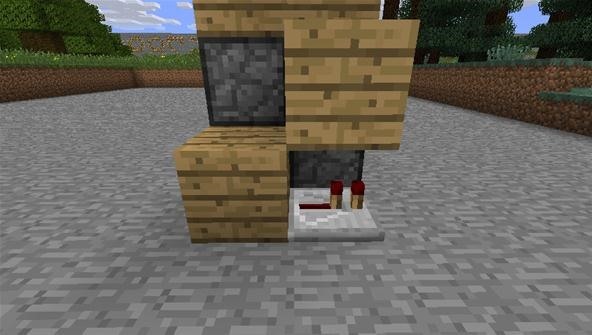 To prevent player entry use a sticky piston and regular put a lever on the top piston and 1 redstone on the bottom. they will think they didn't see anything and go away. Enjoy! I have the same door set up but I have been having problems using a button instead of a lever. I figured out how to use the button. But the problem in getting the door to stay shut. When I hit the button the door shuts then opens. I want it to do the opposite. Open then shut. Or even better just stay open until I close it from a button on the opposite side of the door. Any help would be much appreciated as I am fairly new to minecraft. Thank you. 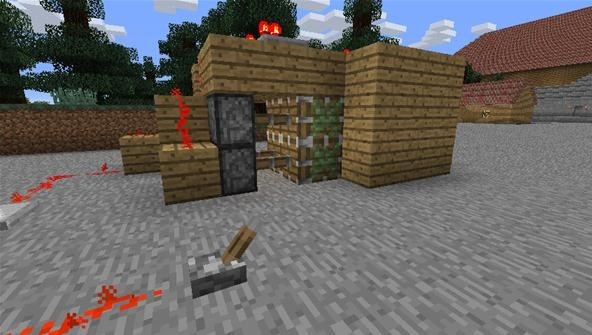 I used this tutorial but instead of a switch, I made the current always-on by using redstone torches and pressure plates. Then when the pressure plates are active, it kills the current. 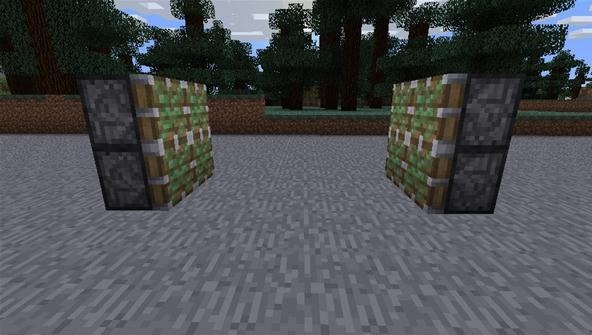 So, the blocks are always covering the walkway unless you walk on the pressure plate and it opens up. Only downfall is you have to do a mad dash out the door or it'll close on you. Nice tutorial to start with.